Photographer QT Luong has captured the volcanoes and landscapes of Hawaii in this stunning time-lapse video he recorded in 2013. 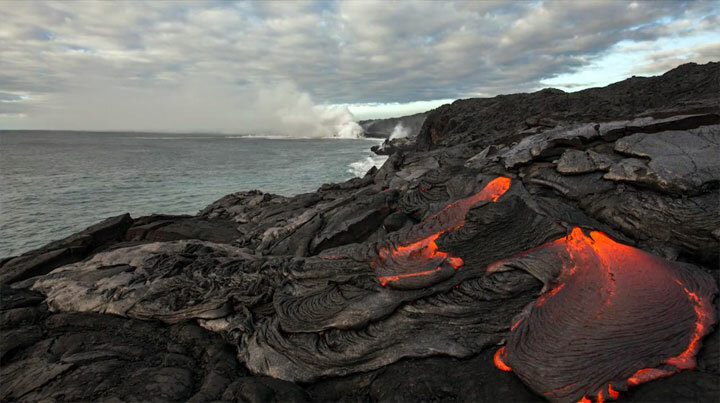 He has photographed each of the 59 U.S. national parks, and shot most of this spectacular “sea-to-summit” project in Hawaii Volcanoes National Park. “One of the most mesmerizing spectacles of nature I’ve witnessed is lava flowing to the ocean as clouds of steam rise from the meeting of fire and water,” he writes. Since 2008, the Halemaʻumaʻu Crater at Kilauea Summit contains an active lava lake which at night illuminates a large gas plume. I captured the Milky Way appearing in a weather break above by setting up my camera in driving rain. Besides filming Mauna Loa, the world’s largest active volcano, from Mauna Kea and Haleakala (I’ve included a shot of the “world’s most beautiful sunrise”), I backpacked for a solitary dozen miles on steep and sharp lava rocks to its 13,700 feet summit. In the morning, my water bottle was frozen solid after I had camped to capture what is likely the first night-time and sunrise time-lapses from the top of the summit cliffs overlooking the immense Mokuaweoweo caldera.